Two great shows early this week, presented by Boston music bloggers. 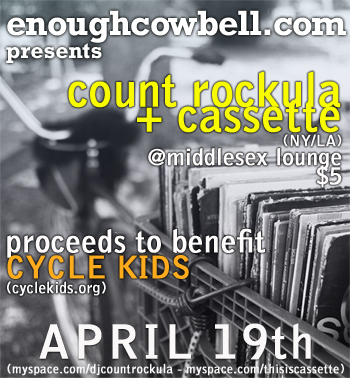 Slightly belated notice for a night of indie electro with Count Rockula and Cassette tonight (Sunday, April 19th) at the Middlesex Lounge, presented by Enough Cowbell. It’s a benefit for Cycle Kids, and you should go. 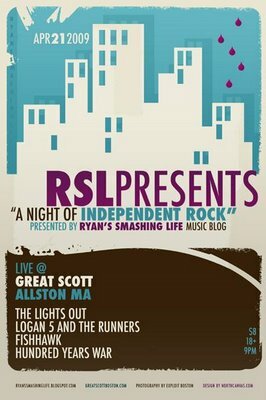 On Tuesday night (April 21st), Ryan’s Smashing Life presents a terrific lineup including z=z faves Logan 5 and the Runners, The Lights Out, Fishhawk, and Hundred Years War. It’s at Great Scott in Allston.